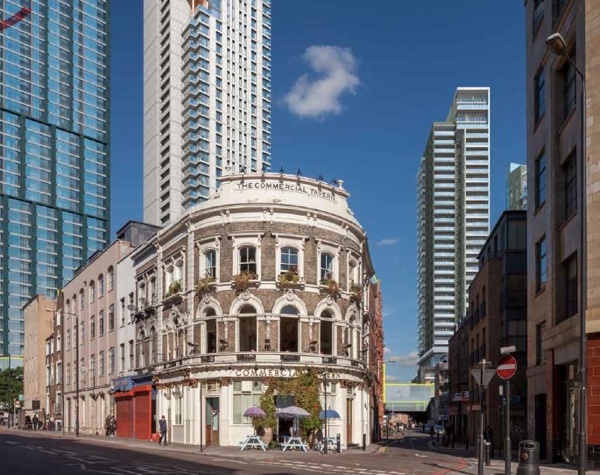 As many readers are painfully aware, a monster development is proposed for the Bishopsgate Goodsyard which threatens to blight the East End for generations to come – already described by one commentator as “the biggest thing to hit Shoreditch since the plague.” Today, I publish this guide to how to object effectively which has been prepared by the East End Preservation Society. This is intended as a clear and simple guide on how to object to the Bishopsgate Goodsyard Proposals. The formal deadline for comments is 8th November and it is best to submit your letters and emails by this date. However, we understand that objections will be accepted until the New Year. It is important that you use your own words because if Tower Hamlets and Hackney councils receive lots of identical responses, they will treat these objections as one in their report, devaluing the number of objections received. It is therefore just as important that you add your own, personal reasons for opposing this development. At some point in your response state clearly that you are objecting to the application, so there can be no doubt that they should take your correspondence as opposition. This is one of the key points to make. Two of the proposed buildings are 48 and 46 storeys tall (plus service equipment on the top which roughly equates to another 4 storeys). Two of the other towers are 30 and 34 storeys tall (plus service equipment on the top). The height is dramatically out of scale with the surrounding area. It will harm the setting of the surrounding 5 conservation areas and their many listed buildings. Even a 20 storey building in this area would be a ‘tall building’. The new buildings do not respond to the character of the surrounding areas and, as generic modern tower blocks, will appear out of place. The massing of the proposed development is overwhelming. The surrounding areas are defined by comparatively small plot sizes and have much lower buildings. The proposed buildings will not integrate with the existing urban grain because of their disproportionate massing. 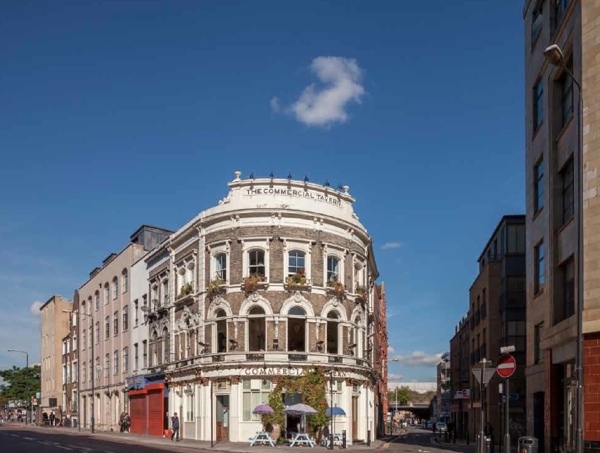 A large amount of 19th-century historic fabric surviving on the site will be demolished including many of the brick arches (labelled in the application as vaults V1-V11) and the handsome Victorian wall that runs along Commercial Street. Light levels in surrounding areas will be seriously compromised. Casting much of the area to the north into shadow. 43% of the existing surrounding buildings surveyed by the developer’s consultants will suffer major loss of sunlight. Obviously, this is not an acceptable level of impact. 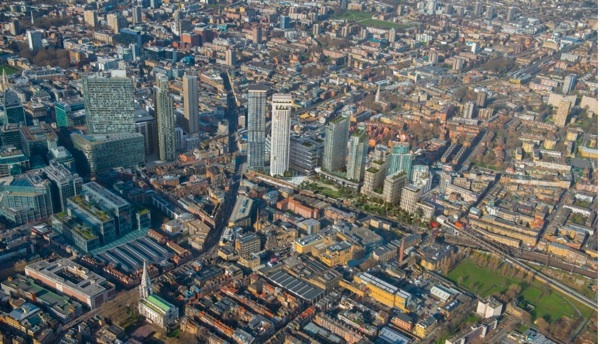 The development will also affect the character of East London around the Bishopsgate Goodsyard site. This is a colourful area, of markets, small businesses, creativity and innovation that only exists because the existing urban grain is small scale and historic. This is a direct contradiction of their earlier statement and a rejection of the planning guidance to which they should adhere. We cannot find any details of affordable housing provision in this outline application. However, should you find any more details within these documents please alert us – and we can pass it on! There are seven ‘Townscape Character Areas’ [areas of distinct architectural identity] outlined by the applicant which are listed below. We have summarised what they say about how each area will be affected by the development. If you live in any of these areas, you might want to comment on whether you think they are correct! 3. 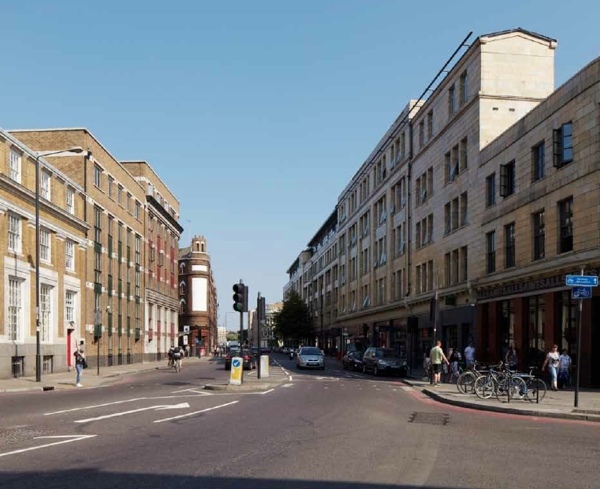 Bethnal Green Road is defined by the applicants as having ‘moderate sensitivity to change’ - this is a way of saying that it will not be greatly affected by the proposed massive new development. 4. 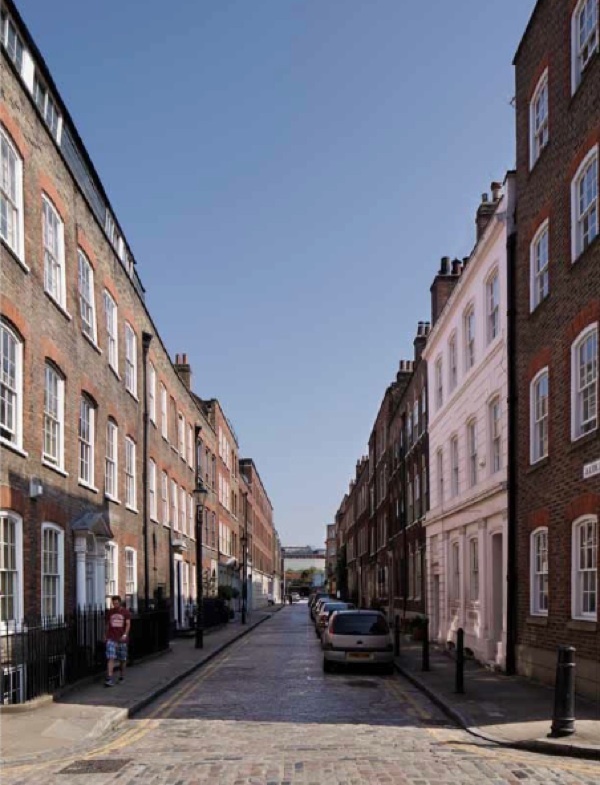 Spitalfields is described, surprisingly, as having ‘moderate sensitivity to change’ despite the fact that this is an area with an extraordinarily high concentration of listed buildings – and one of the most important historic districts of London. Both Tower Hamlets and Hackney Council will potentially be deciding the applications. GOOD GRIEF, those pictures really do emphasize the massive impact that this monstrosity of a development would have on this area, the fact that any planning officer would even need public opposition to persuade them of the absurdity of such a development is in itself a telling indictment of the attitude of many local authority’s, Spitalfields more than any area of Britain has always been an area of change, but change can only be justified if it brings progress, and the progress must be for the general good of everyone, not just the selected few, and the relentless pursuit of COMMERCIAL development regardless of the social consequences as proposed by this development is MORALLY WRONG, = PROGRESS =YES, but at ANY COST = NO. Yes Valerie, anyone from anywhere can object. One extra point, that is often forgotten about tall buildings, especially if there are groups of them…. Tall buildings divert & funnel even moderate breezes & can significantly increas ground wind-speeds, to the point of discomfort & danger – people get blown over & hurt. That development is appalling.When people train to be architects arent they taught about scale,or relevancy to the surroundings?Or is this just another example of the poor education that blights this poor country.I hate what is happening & allowed to happen through greed & incompetence! Thank you so much for these guidance notes! I felt overwhelmed until now with so many objections but not quite knowing what to do for the best. I shall marshall my arguments and send them today. BEWARE! One fine day they can only blow up these ugly things which offends ones eyes! — HRH Prince Charles should be involved here! Thank you so much for providing this guidance. I will be lodging my objection forthwith and encouraging others to do too. Thank you for taking a stand and informing the world of these awful plans. I am Belgian and we don’t have a lot of tower buildings here, personally I think London is getting too much of them. Then I will send my letter! TGA, thank you for emphasising the importance of cc’ing Eric Pickles. As we know, Boris Johnson did not hesitate to overrule the council’s decision against the ‘development’ of the Fruit and Wool Exchange. We really need to get Mr Pickles involved. It is tragic the way the character of London is being eroded by skyscrapers so that historic buildings are dwarfed and increasing London appears to resemble singapore..
How much does the blame lie at the feet of Boris Johnson who often gives the green light to these developments? We should start an action group and start lobbying HRH Prince Charles to add a bit of clout to our argument. Letters on their own may or may not have any impact, whereas a letter from him would certainly help. We need some help from somebody in the know. The scale of the tower blocks is enough to warrant an objection. But beyond that the proposed blocks are of the blandest design with zero architectural merit. Even in twenty years they would not be valued and would be seen as adding nothing to the built environment. This is a current trend that is being driven by a bubble in asset prices. When (not ‘if’) the bubble bursts monstrosities such as this wouldn’t see the light of day. It’s important that they aren’t built now! 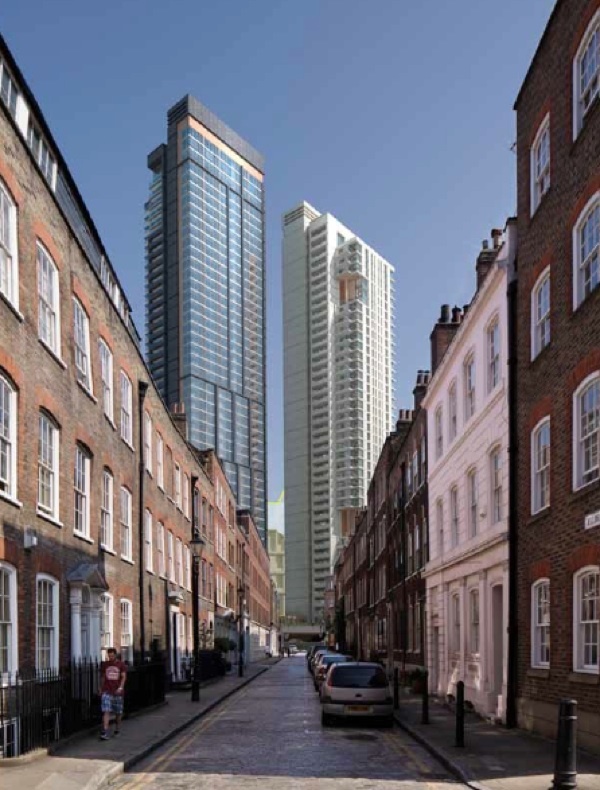 These horrible towers also have to be viewed in the context of the dreadful planning decisions already taken just across the road, namely Bards 50 story Tower, Plough Yard and Principal Place, Bishopgate, also awful designs, also purely greed driven. 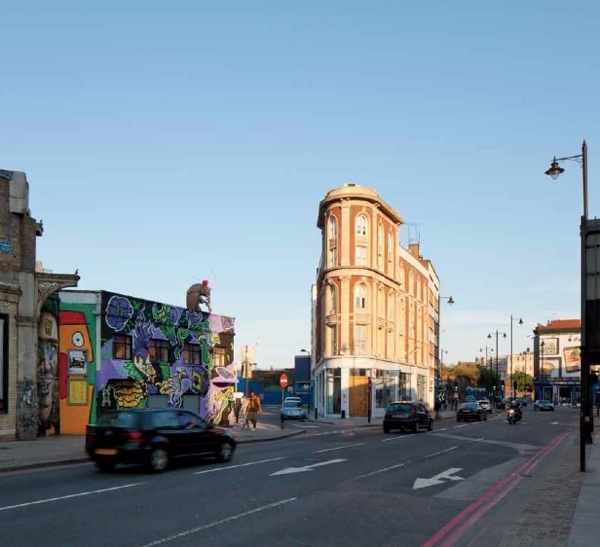 With the addition of these monoliths a dull and windy cross roads will be created in the most interesting cultural and historic intersection in London – Spittalfields, Shoreditch & Bethnal Green. These planners and developers are ripping the heart and soul out of the area , and replacing it with identikit glass box rubbish, it’s boarder line criminal that 200+ years of history can be ruined in less than 5 years. Greed, corruption, money – it’s like a horrific Amis novel in real life. I’ve just written to each of these three individuals strongly objecting to these monstrous proposals. We’ve seen off damaging plans in the past and I’m hopeful we can do this again in this instance. I added my 2 pence worth. It is disheartening that this sort of over-scale development is constantly threatened. Where will our sky go! Apart from the continued crowding, there’s the question of how long these buildings will last. Most of the developments going up now will not be there in twenty or so years’ time, because we won’t be able to sustain the supposed growth that calls for them. So they’ll end up coming down, after causing damage to the local scene, and goodness knows what will replace them. Thank you for bringing the proposed development plans to wider public attention plus an easy to follow guide for making a constructive objection, I will certainly be doing so. Those photos show what could come to be horrific. Thank you for this information, I was aware there was to be some development but had no idea of the scale of things! I’m not very good at knowing how to word objections but I will certainly do my best. Good to hear that non-UK residents can also object. I have just e-mailed my objection. Can’t let them do that to the city I love! The new tower on Bethnal Green Road next to these towers has already created a potentially lethal wind funnel. Less than a year ago while standing on Sclater St a huge squall came down the street, tore corrugated roofing off the premises alongside the new railway and blew a cyclist backwards off her bike. The wind hazard itself cannot be mitigated, it will get worse. We have seen enough destruction of London’s skyline. I’d move to Toronto or singapore if I wanted to live in a place that looked like every other identikit tower dominated urban landscape. Apart from the affordable housing, the vast majority of housing space will become empty properties owned by non doms who contribute nothing to the character or economy of the neighbourhood, check out all the other ghost residential towers opened in the past 5 years. Has anyone thought about getting Dan Cruickshank involved? He lives near Elder Street I believe and was one of the original campaigners who saved the historic housing of Spitalfields when developers wanted to knock it all down in the 70s. He was also involved in the campaign to save The Light Bar building(which at the moment looks like it’s under scaffold and will be bulldozed). Getting someone of his calibre involved would be a good thing! We live in EC2 and my husband works in Shoreditch. We don’t need any more identikit glass towers of limited architectural merit degrading the historic cityscape of Spitalfields and Shoreditch. Especially one that won’t offer any affordable housing to Londoners. As for providing more office space… you only have to look at all empty A1 class offices around the City to see we don’t require any more of those! When will these meglomaniacs stop? They are destroying London with these awful, crass symbols of greed and vanity. The really sad thing here is that it was down to Ken Livingstone that the proliferation of high rise building took place. He removed the restrictions, and very soon London will end up looking like ‘Mega City’. 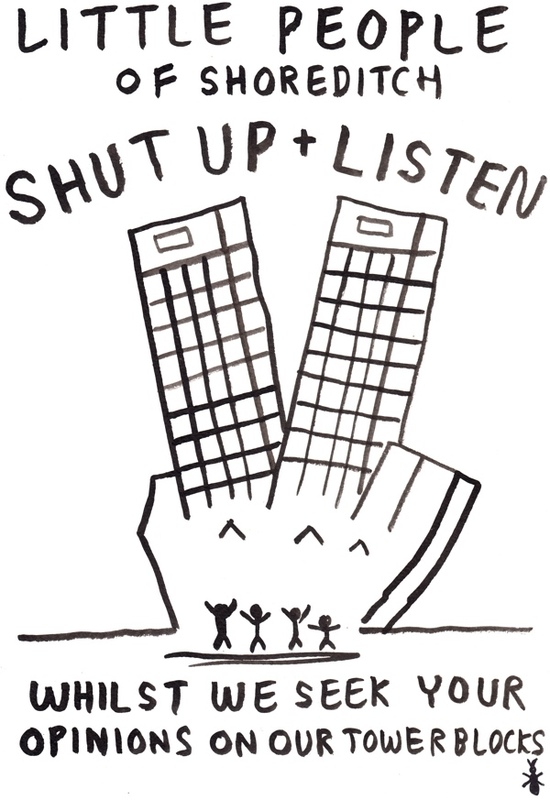 The Cheesegrater shed two massive steel bolts yesterday and last year the Walkie Talkie fried a motor car. For the sake of this wonderful city’s heritage, please stop building this stuff! 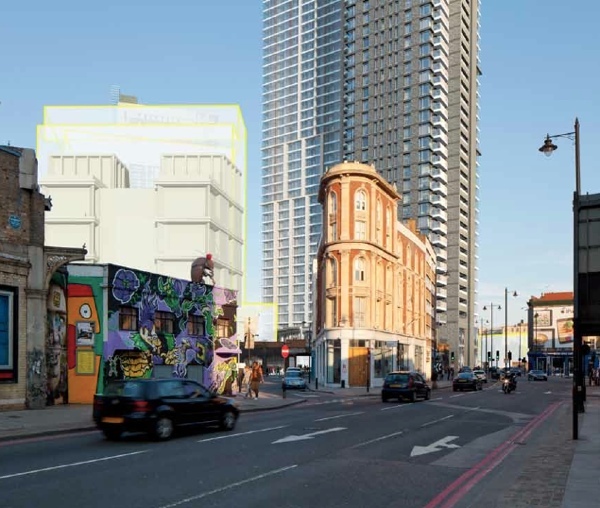 I thought the Nichols and Clark scheme achieved some sort of balance but this Goodsyard proposal is gross and such an unimaginative use of this special site. I have objected to both local authorities and to Mr Pickles, although I feel little enthusiasm for getting him involved. 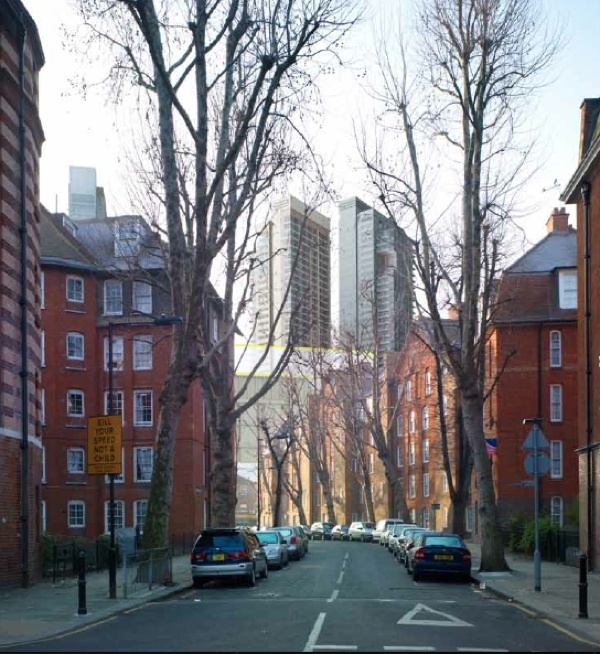 The pictures of the proposed tower blocks look to be overwhelming the present local buildings. Will they immediately be bought up by foreign (Chinese etc?) interests to be let for the luxury renting market at a great profit? The proposal looks to completely spoil a traditional area. As an Australian, I might seem far removed from these developments. However, in the 19th century, this was the home of my family and I’d hope that the area would be treated with respect. I am not against development but it should be in harmony with the character of the existing surrounds, not visually overpower them. I’ve recently spent some time in the East End and I want to see the character of the area preserved. The tourist ‘dollar’ or ‘pound’ is an important source of revenue for England – don’t destroy those things that make people want to visit. Landmarks like Nelson’s Column, though interesting, are not where my family lived and worked. Preserve the East End. 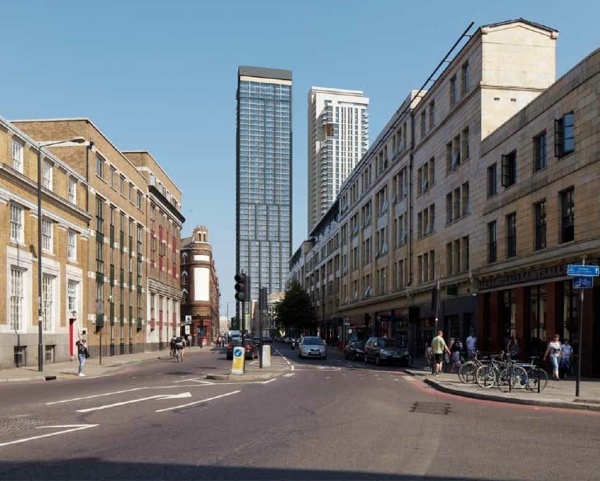 proposed for The Bishopsgate Goodsyard. and people working in the area like myself. ourselves living in a darkened less attractive space? people that live and work there. wrong and fundamentally ignores residents and workers to the north and south. authorities very closely to see how they deal with this. Although aware that something unpleasant was happening, I had no idea of the scale of these buildings and their impact on the surrounding area. Why do we have planning officers who allow things like these to be serious proposals for development? More widely it seems to me there is no strategy for the whole of London which, as people say will become like any other high-rise dominated city. Why will people want to visit us when that happens? Unlike other cities there seem to be no rules otherwise how did that awful bullying building in Fenchurch Street ever get built? Paris, for example, simply decreed that within in the central ring no tall buildings will be built – no ifs or buts. These two blocks are a total eyesore. They do not fit with the present area’s buildings. While I can see that some of the building that has happened in the last 10-20 years has definitely improved the area, the character has been affected considerably. The general Bishopsgate area now looks like many of the faceless ‘business areas’ of large cities throughout the world and the ‘London-ness’ is being destroyed. Do these buildings have to be so high? Do they have to be so ugly? Many years ago I moved out of London (unsuitable accommodation and a baby on the way) to a new estate of houses in Suffolk. The houses were a delight to live in, and while there were problems that the architects had not addressed (lack of amenities, for instance), when the architects visited I distinctly remember that they told me that the density of accommodation was actually higher than on a tower block estate, although there was grass and there were trees, because they did not have to allow for wind funnelling and a variety of other problems that arise with very tall buildings. Could a rethink not be done — even something a bit less like a very tall egg box would be an improvement. as a long term Hackney resident and former resident of old Spitalfields, I am heartbroken about what is happening and despair of our ability to influence the powers of money. Please could you answer my two questions. 1. Is it true that the Head of Planning in Hackney is given a bonus for every planning consent pushed through? Can this be morally right? Does this explain some of the very insensitive decisions and monstrous buildings that are currently being imposed on Hackney? 2. What is going to happen to Norton Folgate? 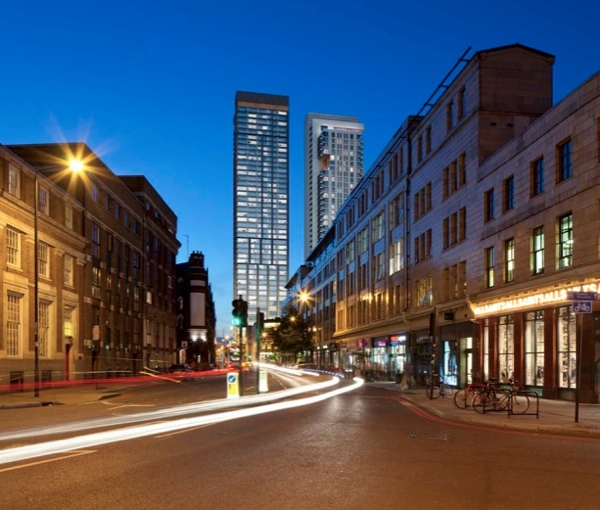 What are the plans for the right hand side of Bishopsgate? I fear the worst. I totally agree with everyone’s comments. However the “affordable” housing situation is ominous. This “affordable” word has slid quickly into housing language and should be stopped. 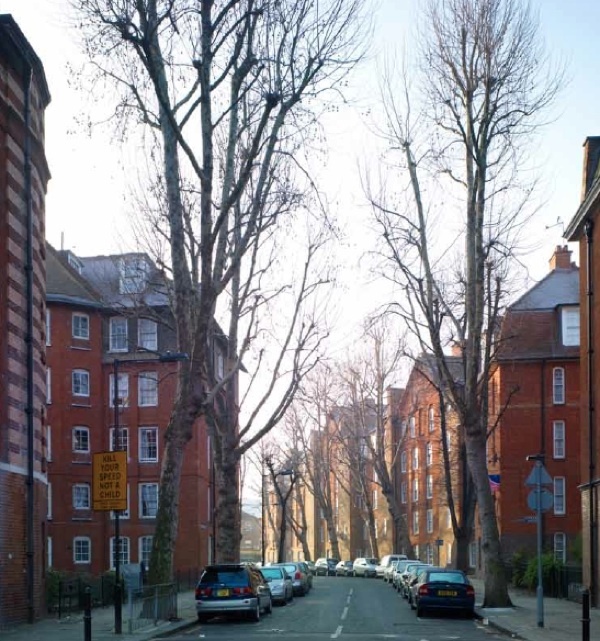 Whatever happened to “social” housing? I guarantee the developer will get a huge Government grant to give the poor people a home, but these “affordable” properties (if there are any) will never be affordable by working class people. Maybe cleverer people than myself can follow this up as it could be relevant to the application.